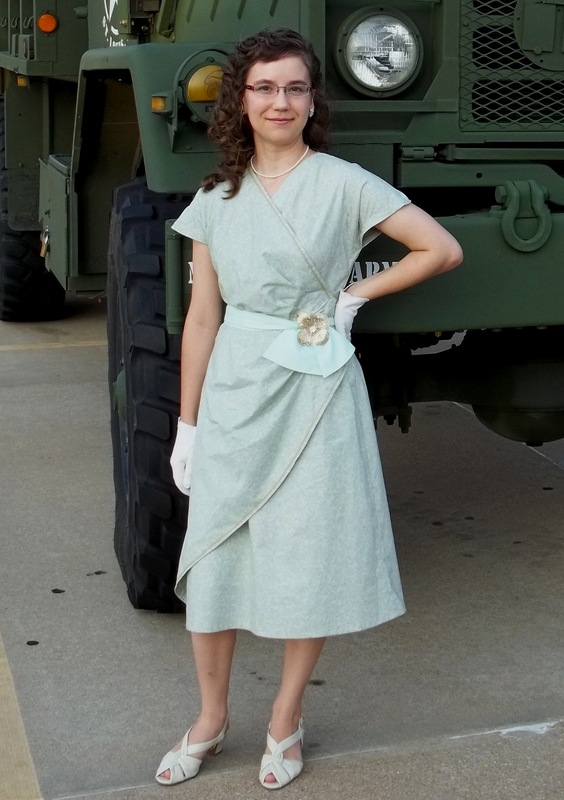 My 1946 Cotton Dress – It’s a Wrap! There is faux fur, there’s faux leather, and a multitude of other imitation items, among which I have made myself a faux wrap dress. This dress is made from one of my vintage original patterns, still in good condition for the year 1946. I am proud of how well I redrew/re-graded this pattern to my size measurements – it gave me good practice in drafting and fits like it is made for me, which is true. Another great point for this dress is the on trend color scheme (it has the Fall 2013 Pantone colors of ‘Linden Green’ and ‘Carafe’ brown), which makes it an excellent season transitional piece for my wardrobe. All this ‘wrapped’ up into a soft and comfy cotton gives me one winner vintage 40’s creation! NOTIONS: I bought two spools of matching thread and a zipper; I already had interfacing, snaps, and the tan mini rick-rack, which was a great vintage original find (I’ll tell you more below). THE INSIDES: they are done the old fashioned way: merely zig-zag stitched along the edges. There were too many corners and curves to do French seams. Look at the back waistline detail of the V-point – so unique, pretty, and dramatic as well as tricky. One of the things about finding and buying vintage patterns is the disconcerting fact that it might not be in your matching size. 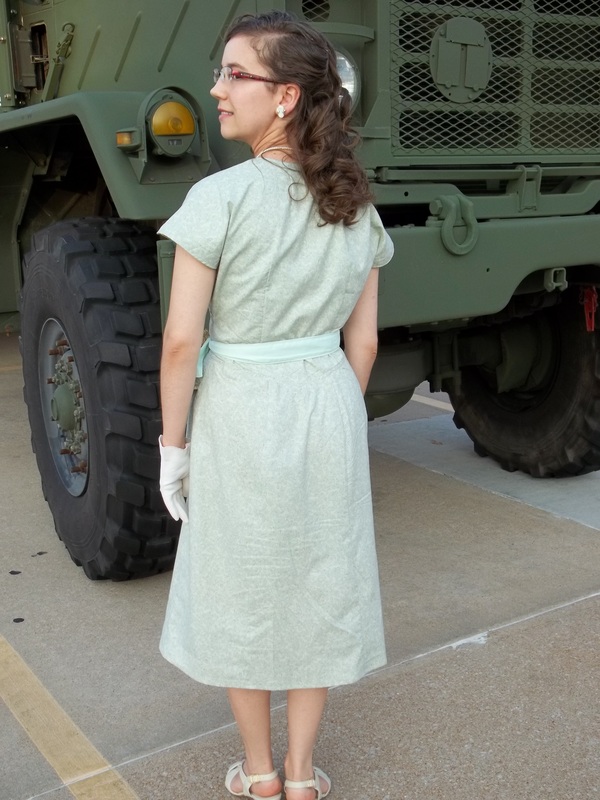 I’ve been putting off sewing up my ’46 mock wrap dress since last year’s Spring on account of the re-grading and re-drafting which needed to be done. Now I am happier that I’ve finally completed this dress. Notice how the envelope drawing shows an insanely skinny “wasp” waist, not to mention it being two sizes too small for my body. Using brown paper grocery store bags (free! ), I traced the original pattern pieces, with all markings, against the glass of a window during the daytime – a natural light box. Then I measured and redrew in the right amount of ease for the hips, waist, and bust to fit me. Now I have a “new”, not-as-fragile copy of my old pattern plus the good feeling I get from both the perfect fit and knowledge learned. Not a touch of fitting was needed which means I might be gaining confidence in my own pattern drafting. This is the third project I have redrawn and resized for myself. The layout of the pattern pieces was arranged a bit strange and complicated according to the instruction paper. Leave it to me to find my own way of doing things! I spent 3 hours trying to figure out the best way to fit all the “on fold” pieces in as well as all the others. Very difficult, I must say, considering the enlargements that I needed to add to the pattern. The large, strange shaped front drapery piece was throwing me off – I would arrange everything on my fabric, study it, then walk away to do stuff around the house while thinking if my figuring was correct. The only way all the pieces fit in was by shortening the dress length so the hem ends right where the drapery ends, which look I like much better anyway. 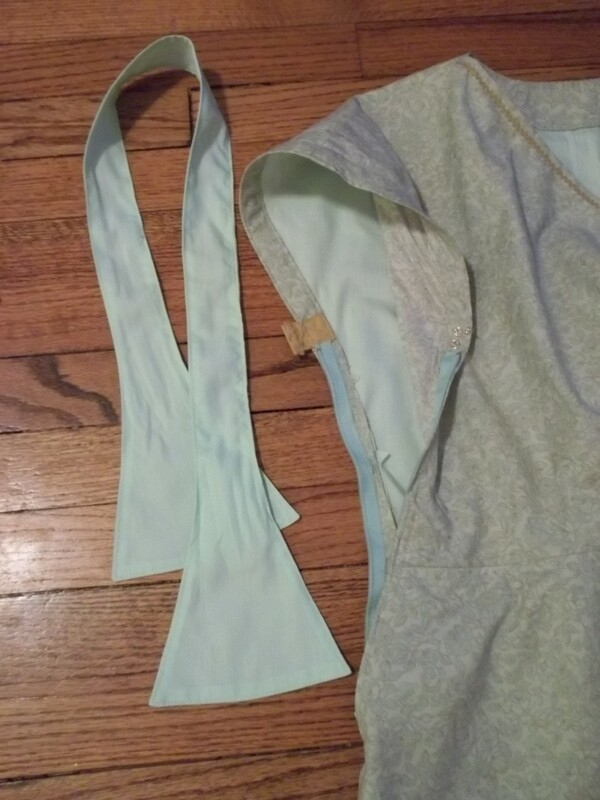 A mint colored scrap of broadcloth which I had on hand went towards lining the back of the bodice and was used to make the fabric belt, also. Why did I do this? I lined the back bodice so I could have something to tack the neck facing onto and also eliminate any see through issues. 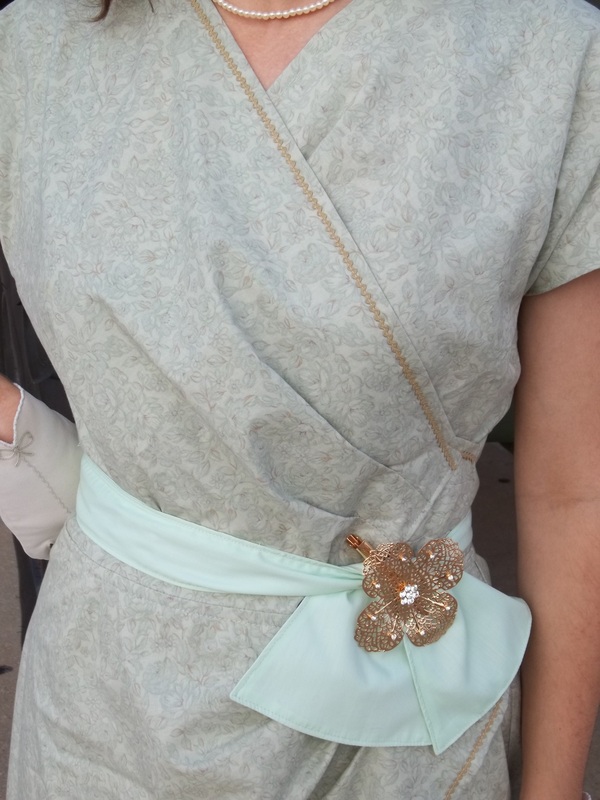 As far as the belt goes, I made the belt out of the mint broadcloth scrap because I literally could find no way to fit the pattern piece in on my floral fabric. Besides, a matching/contrast color seems better for a belt with this dress anyway. On account of only having scraps to use, I had to cut out the belt in two halves and sew up a center seam. Talk about making do! I really like how the belt ends fan out – what a fun design lacking in modern patterns. The mock wrap has some smart design elements. The two front bodice pieces had three tucks at the one end, which together made a dart which matched with each other as well as matching to the back bodice. My dress’ front under skirt section has darts sewn in at the waistline for shaping, just like any pattern. But the drapery is cut on the bias and as it gets stretched across the waistline…voila! The darts matched up perfectly and the drapery fits nicely over the tummy, using the bias of the fabric to achieve a nice fit and hide the under skirt darts. Notice there are three darts sewn into the side of the skirt drapery too. All edges have facings sewn on them for a nicely finished look but – oh – were those facing pattern pieces were a bit unexpected. In the close-up picture above, I hope you can see some details. Soft greens are highlighted by subtle touches of a Carafe brown in the printed fabric of my dress. You might notice my small tuck sewn in vertically along the side of the bodice darts. Ah, yes, I suppose I did do a slight fitting alteration – I took in the wrap part slightly so it would lay nicely across my chest instead of poufing out. As I mentioned earlier, take note in the picture of the tiny rick rack along the front edge of the mock wrap. They just don’t make rick rack that small easy to find anymore. How it got on my dress was a happy circumstance. Without a front decoration my dress seemed more like a nurses uniform. This tan tiny rick rack matched so well, better yet, is a vintage find that was bought at THE SAME STORE from which I bought the pattern used for my dress! The rick rack was truly dated, wrapped around the piece of an old cereal box. It seems the notion and the pattern were just made for one another! I’ll tell you one thing, I am DONE with those silly side zips that end a few inches below the armpit and only make you wiggle and struggle just to get your dress on yourself. For this dress, I extended the zipper all the way up to under the armpit. A small piece of bias tape was used to make a double snap placket to keep the zip closed and protect my skin. (See picture at right) Doing full side zips this way is the new normal for my vintage dresses from now on…I love it. It’s so easy and much more handy to slip into…why not!!! It’s either this tactic or back zippers. 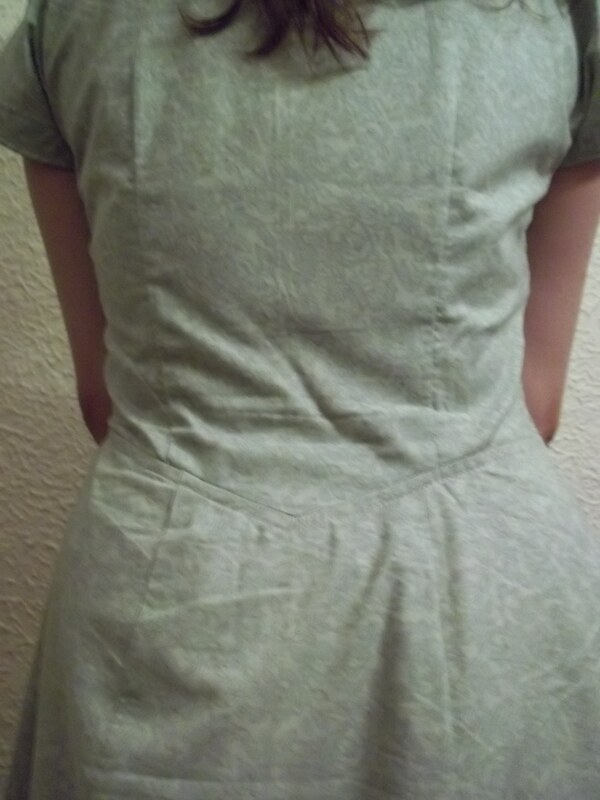 My automatic reaction to the tricky V of the back waistline was to do a lapped seam. However, I though better than to change the pattern. Just reinforcing the point with stitching then clipping to open the point worked out quite well. To my surprise, neither of these sewing steps were mentioned in the brief instructions…maybe it was assumed the sewer would know what to do. The curve of my lower back is a spot that fits funny in many other patterns, but fits great at the dipping V back waistline of my mock wrap dress. The picture below may not be the best; however I hope you can see something from it. 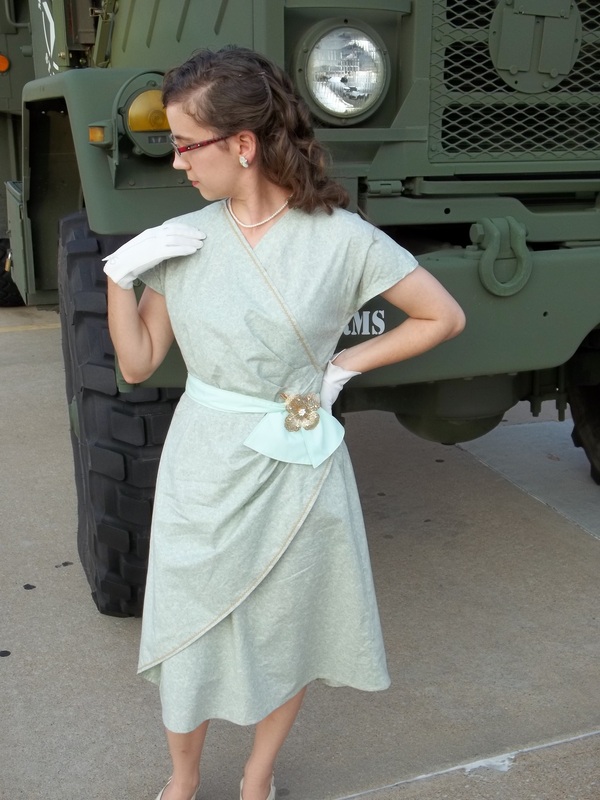 Come to think of it, this mock wrap dress is actually the second dress I have made from the year 1946. 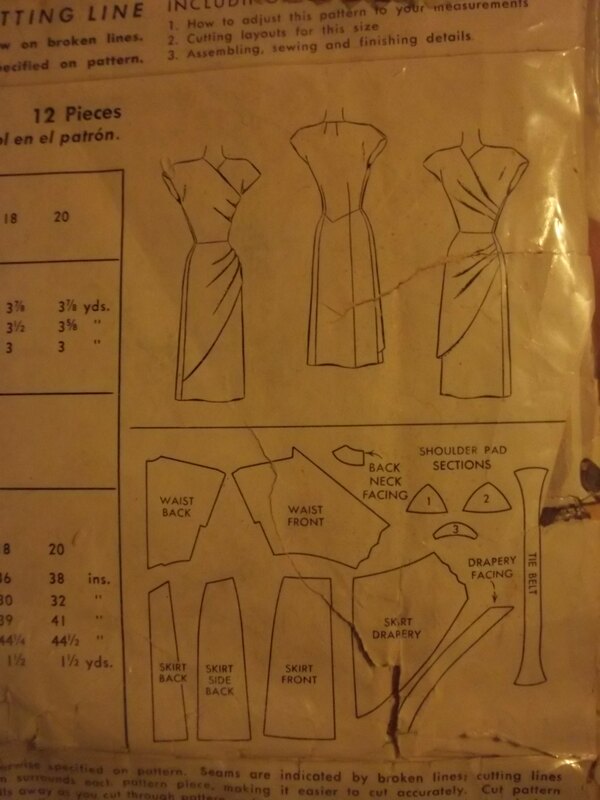 My first one was a Vintage Vogue reprint, #8728, with the gathered bodice, click here to view this project. Both my 1946 projects have good things going for them: great comfort, season spanning, and a simple classy design. 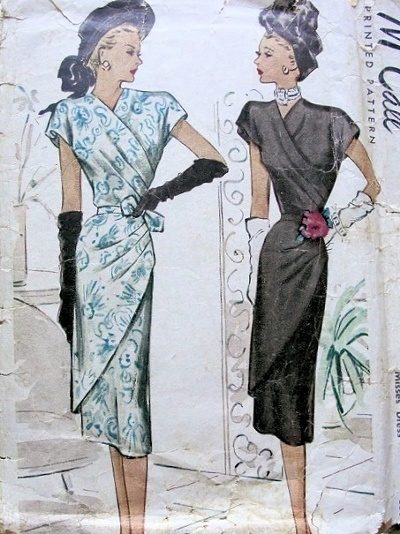 I can now understand why dress patterns such as my mock wrap and the Vogue gathered bodice were popular among women of the 40’s – a lady can look nice and comfy with out necessarily feeling dressed up! This entry was posted in 1940's and tagged "wrap dress", 1940's, carafe brown, cotton, dress, Fall for Cotton 2013, linden green, McCall 6724, mock wrap, Pantone Fall 2013 color, pattern grading, rick rack by kellycb. Bookmark the permalink.